We were busy this year. We organized over 150 workshops across the country, with 4500 participants taking part. Alongside these educationals, locals haves taken steps to recognize their health and safety activists through the presentation of Appreciation Awards. This raises the overall profile of health and safety – and gives activists more visibility to do their work. (You can nominate someone for an award by visiting cupe.ca. We held eight provincial health and safety conferences across the country, with close to 1200 members attending. These events helped highlight important issues in each division, and provided opportunities for rank and file members to experience the new health and safety learning series. This year we also created profiles of members across our sectors, showcasing their efforts to overcome workplace hazards. Many locals embraced the Year of Health and Safety. 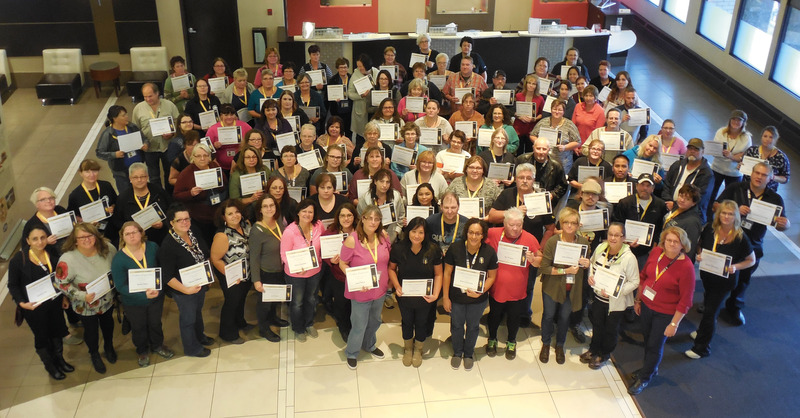 CUPE local 3967, health care workers in Regina, booked off around 120 members from their steward and health and safety networks to take the new nine-hour introductory session. And the CUPE Vancouver Island District Council offered a number of the new learning series courses in their educational conference which saw around 125 members attend. It’s been a great year, and we hope the momentum, especially around training and sharing, continues for years to come.